A movie that portrays politicians as corrupt? Believe it or not, this film nearly didn't get made for precisely that reason. 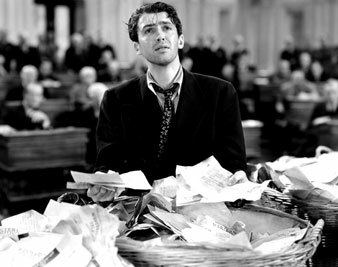 Everett Collection Jimmy Stewart in Mr. Smith Goes to Washington, 1939. Stars: James Stewart, Jean Arthur. A movie that portrays politicians as corrupt? Why it was downright Un-American. Believe it or not, this film nearly didn’t get made for precisely that reason. Mr. Smith Goes to Washington (Columbia) is so far the best Hollywood picture of the year. It is pleasant to be able to say this without if’s and but’s. The film runs for more than two hours, and there is not a dull moment. There are concessions to the box office, but they are made with such skill and discretion that they do not offend. And there are many concessions to good taste from which the average moviegoer seeking mild entertainment may derive enjoyment. The picture repeats, it is true, the Ms. Deeds Goes to Town formula of the pure country Parsifal, but is not this formula the eternal one of St. George and the dragon? No other picture in a long time has had a script of such workmanship. Sidney Buchman wrote it on the basis of a story by Lewis it. Foster. Precise, advancing the plot and its idea with every scene, it sometimes reaches, with the help of excellent dialogue, the poetic realism which characterizes the French pictures Harvest and The End of a Day. An honest young man is sent to the country’s capital as Senator by the corrupt political machine of his home state; the intention is to use his inexperience for fraudulent ends. But being an honest fellow—I avoid the word idealist, which seems nowadays to be applied to anyone who is not prepared to steal—he clings to his notion that he must tell the truth and fight even for lost causes. Of course he wins in the end—and we know all the time that he will—but the war in which this happy ending is achieved makes the picture perfect. As the story is told, it is a modern, and successful, fairy tale. Frank Capra has added a new masterpiece of direction and production to his imposing list. There are few pictures of such pace without haste. Every possibility of the camera is used to convey atmosphere and information. I am thinking especially of the excellent sequence showing the better aspects of Washington as seen through the eyes of the hero, and another sequence which exposes the workings of a corrupt organization. The Senate chamber itself, with its members, is reproduced with frightening reality—big scenes, hundreds of people, but not the usual mass scenes in which every individual is lost. In contrast many intimate scenes show the hand of a director who in mastering technique has not forgotten his art. James Stewart as Jefferson Smith takes first place among Hollywood actors. It is not so long ago that he first drew attention in a small part as the criminal brother in Rose Marie. Now he is mature and gives a difficult part, with many nuances, moments of tragi-comic impact. And he is able to do more than play isolated scenes effectively. He shows the growth of a character through experience. The art with which he causes the man to emerge out of the simpleton would in itself makes the picture worth seeing. In the end he is so forceful that his victory is thoroughly credible. One can only hope that after this success Mr. Stewart in Hollywood will remain as uncorrupted as Mr. Smith in Washington. There are many other excellent performances: Jean Arthur as the cynical secretary with her heart in the right place; Claude Rains as the Senator who plays the game; Thomas Mitchell as a journalist with the sensibilities of a suppressed poet; and many others. Harry Carey as president of the Senate deserves special mention. In addition to all this the picture has the spirit of true democracy—there is no trace of the fake patriotism which certain business men have been trying to sell in the movie houses. On Your Toes (‘Warner Brothers) is a pleasant musical featuring the dancer Zorina, one of the most beautiful and most sympathetic members of her craft. Jamaica Inn (Erich Pommer production) is a crass disappointment. Hitchcock of The Lady Vanishes must have been asleep while directing this picture, and Charles Laughton, the star, is mistaken if he thinks it is enough to rest on his laurels and display the eccentric qualities of his fat face. Jamaica Inn is a fraud perpetrated with great names. The March of Time for the month, which shows certain aspects of the English fleet, fails to achieve the interest of its report on the Maginot Line.